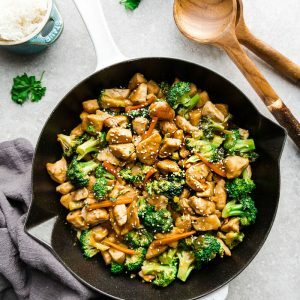 Chicken and Broccoli Stir Fry – the perfect easy dish when that Chinese takeout restaurant craving hits! Best of all, made with juicy chicken, tender broccoli & carrots – coated with a rich and savory Asian-inspired sauce. A healthy stir fry recipe that’s simple to customize & ready in under 30 minutes. Stir fries are one of our favorite easy dishes we make during busy weeknights. The kids love whenever we make their favorite Chinese restaurant takeout dishes at home. 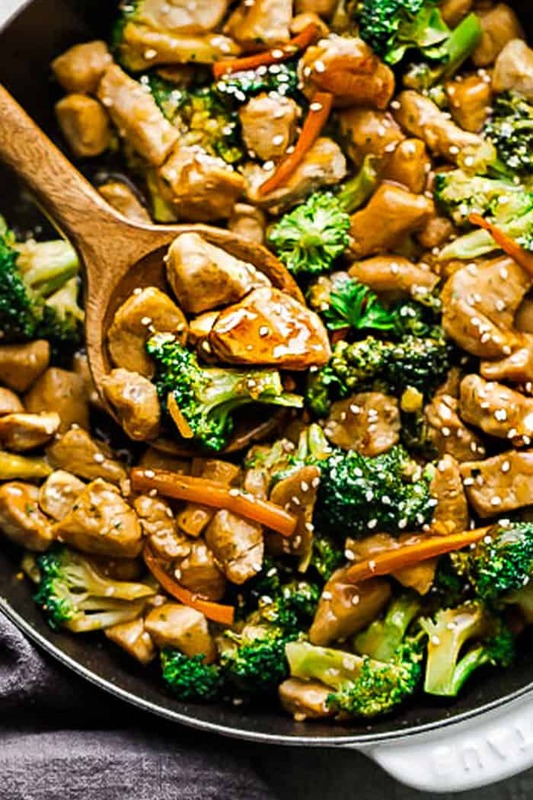 A few favorites include this Chicken Stir Fry with Broccoli & Snap Peas, Cashew Chicken, Beef & Broccoli , Kung Pao Chicken and this Chicken and Broccoli stir fry. All of these stir fries take no time at all to make and the best part is, everything cooks up in just one pan. 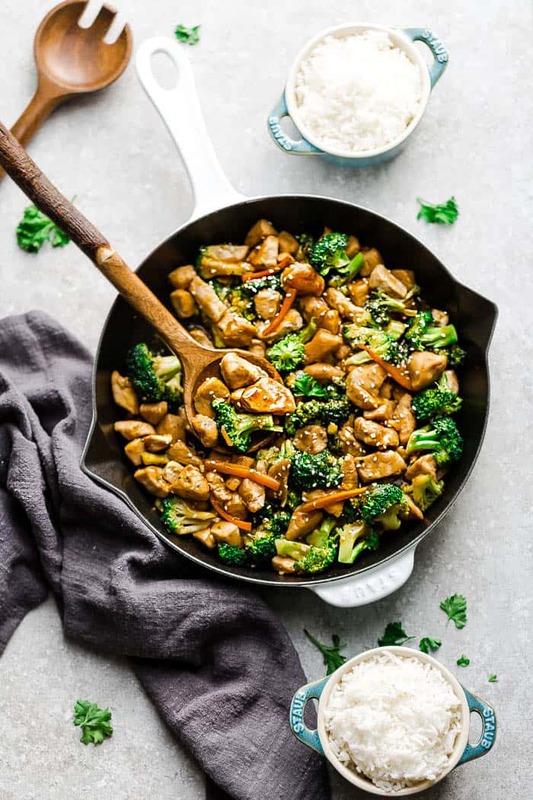 This Chicken and Broccoli Stir Fry is the perfect recipe for cleaning out the fridge and is based off of our popular Beef and Broccoli stir fry. You can use broccoli and carrots like I did here or use up any other odds and ends. Snap peas, asparagus or even bok choy would be delicious. There are no rules when it comes to stir fries. Be creative and use what you have on hand. If your new year’s resolution is to eat healthier, I’ve even included options for those following a paleo or keto diet. Serve with a side of cauliflower rice or over a bed of zucchini noodles. 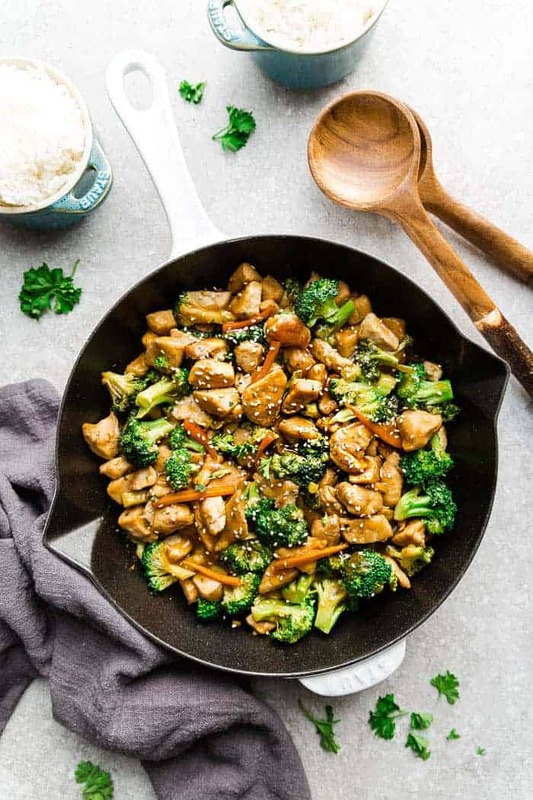 Either way you choose, this Chicken and Broccoli Stir Fry is a healthier, tastier and easier way to get your Chinese takeout craving fix! Start off by browning the chicken in a wok or skillet. Once the chicken is cooked through, set aside onto a plate. Add the vegetables, garlic and ginger, and cook until just tender crisp. We don’t want the broccoli or carrots to get overcooked. Add the cooked chicken, garlic and ginger back into the pan. Whisk together the soy sauce, oyster sauce, honey, sesame oil, Mirin (or dry Sherry), cornstarch and water then pour over the chicken and vegetables. Allow the sauce to bubble and thicken and add extra water as needed to thin out the sauce. Serve hot with a sprinkle of sesame seeds and your favorite sides. Jasmine rice, rice noodles, brown rice, cauliflower rice or even zoodles would be fantastic! 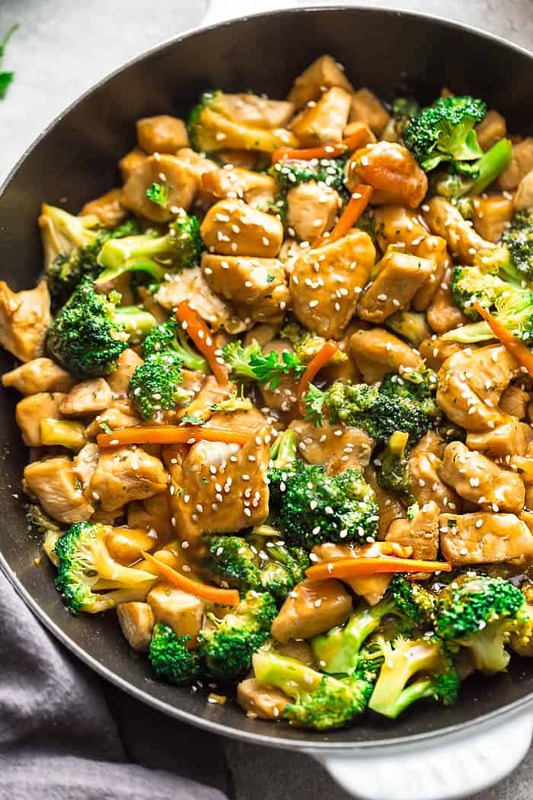 Chicken and Broccoli Stir-Fry – the perfect easy dish when that Chinese takeout restaurant craving hits! Best of all, made with juicy chicken, tender broccoli & carrots – coated with a rich and savory Asian-inspired sauce. Simple to customize & ready in under 30 minutes. In a medium bowl, combine chicken with salt, black pepper, and 1 teaspoon sesame oil. Set aside for at least 10 minutes. In a large skillet or wok, heat cooking oil over medium-high heat. Add chicken and saute until no longer pink and cooked through, about 4-5 minutes per side. Transfer to plate and set aside. Return the pan to heat and add additional oil as needed. Stir in broccoli, carrots, garlic, and ginger. Cook until tender crisp, about 3-5 minutes. While the broccoli is cooking, whisk together all the ingredients for the sauce in a small bowl. Once the vegetables are tender, add the chicken along with sauce into the pan. Allow sauce to thicken and bubble and add additional seasonings along with water as needed to thin out the sauce. Sprinkle with sesame seeds and chopped green onions if desired. Serve hot over your favorite rice (cauliflower for paleo & keto), quinoa or noodles.